4. Leave me a comment with your email. The giveaway will end on the 22nd of February. 4. Deixarem-me um comentário com o vosso email. A giveaway acaba a 22 de Fevereiro. I'll leave you the links of the clothing I added in the picture above! Deixo-vos os links das roupas na image! Ai quem me dera! :D HEHE Coisas tão giras! 1 and 2 are my favorite!!! Awesome giveaway! OMG! i just fall in love with this amazing shorts! I've got one too and looking for some votes for a contest! If you could help me out I'd be overjoyed dear. Thank you for visit and comment my blog! love your blog and your edit dear!!! I follow your lovely blog via GFC and FB! Fantástico! Adoro os calções da imagem! I've done all of the above! I follow you on Facebook/GFC as Cambria...and I like/follow Chicnova. Fantastic look :) You're blog is amazing !!! italiancappuccino.mg@gmail.com para o site chicnova, e meu facebook é Monica B. Vieira (não é com o mesmo endresso). I join your blog via GFC and FB! Follow you on GFC and liked your Facebook page! Thanks for stopping by my blog and telling me about this great giveaway. I entered! I am a fan of your FB page as Oh to Be a Muse Blog. 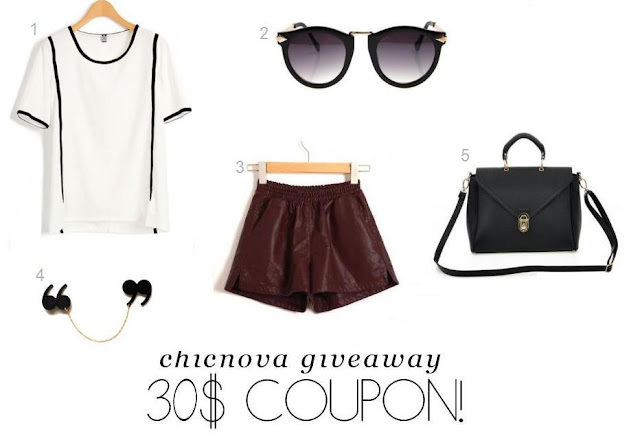 Great giveaway, I love chicnova! Join via GFC and FB!